NETWORK FINALS: BLACK-ISH lost 0.1 in final numbers. CABLE HIGHLIGHTS: History’s VIKINGS gained 0.09 from last week to 0.74, and that gave the new SIX a solid lead-in for a 0.48 premiere, which was also simulcast on A&E (0.16) and LMN (0.08). ESPN’s late Oklahoma City vs. Golden State game topped Wednesday cable at 1.18, with the earlier Milwaukee vs. Houston game at 0.56. Discovery’s ALASKAN BUSH PEOPLE rose 0.04 to 0.78. VH1 aired 2 episodes of BLACK INK CREW at 0.74/0.69. TBS’s FULL FRONTAL continues to do well in its new Wednesday perch, down 0.04 to 0.47. On TLC, MY 600-LB LIFE gained 0.05 to 0.47, and TOO CLOSE TO HOME was down 0.03 to 0.30. ID’s HOMICIDE HUNTER climbed 0.04 to 0.41, and I, WITNESS was up 0.04 to 0.33. On Lifetime, LITTLE WOMEN ATLANTA fell a tenth to 0.40, and VIVICA’S BLACK MAGIC was down 0.07 to 0.21. FX’s IT’S ALWAYS SUNNY IN PHILADELPHIA grew by 0.08 to 0.40, and MAN SEEKING WOMAN ticked up to 0.13. On HGTV, PROPERTY BROTHERS dropped 0.04 to 0.37. 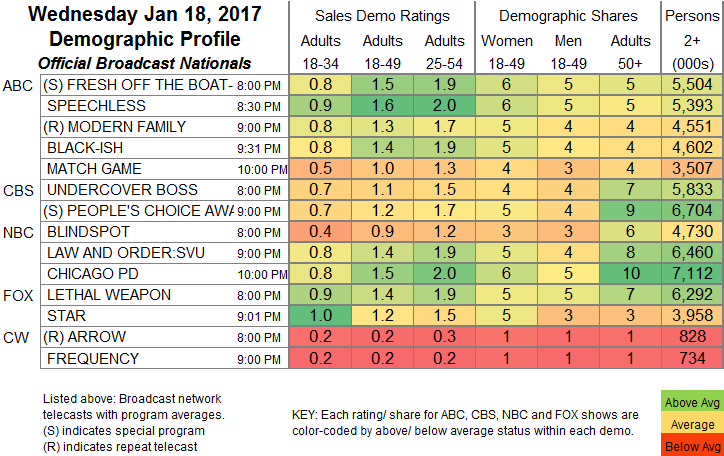 Food Network’s COOKS VS CONS was up 0.03 to 0.34. 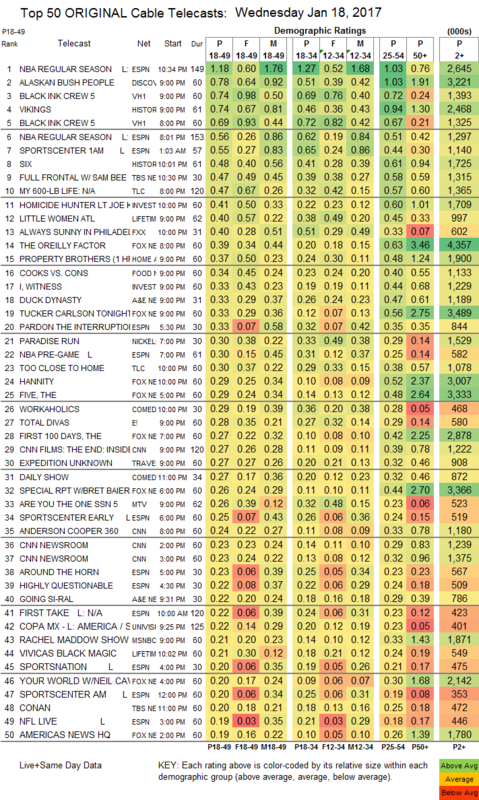 A&E’s DUCK DYNASTY lost 0.03 to 0.33, and the season finale of GOING SI-RAL was up 0.03 to 0.22. On Comedy Central, WORKAHOLICS ticked down to 0.29, and JEFF & SOME ALIENS was down 0.02 to 0.16. E!’s TOTAL DIVAS held at 0.28. MTV’s ARE YOU THE ONE fell 0.17 to 0.26, and the AFTER-SHOW was down 0.13 to 0.12. Syfy’s INCORPORATED ticked up to 0.15. Bravo’s GIRLFRIENDS GUIDE TO DIVORCE was down 0.02 to 0.13. POP’s SCHITT’S CREEK was steady at 0.08. WGN’s next-to-last SALEM fell 0.03 to 0.05. NOTE: we won’t have ratings for sub-Top 150 shows like LUCHA UNDERGROUND until tomorrow.